It would be fair, I think, to say that Transition was slower to take off in France than in some other European countries, but it now feels well underway. 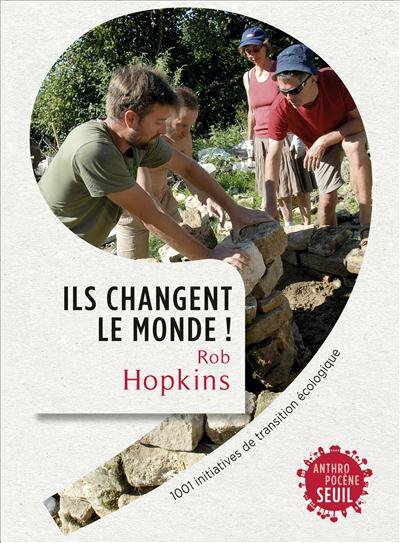 This evolution has been greatly aided by the recent publication, by Editions du Seuile, of the French edition of The Power of Just Doing Stuff, entitled Ils Changent Le Monde (“They Change the World” – apparently “stuff” is a tricky word to translate into French). 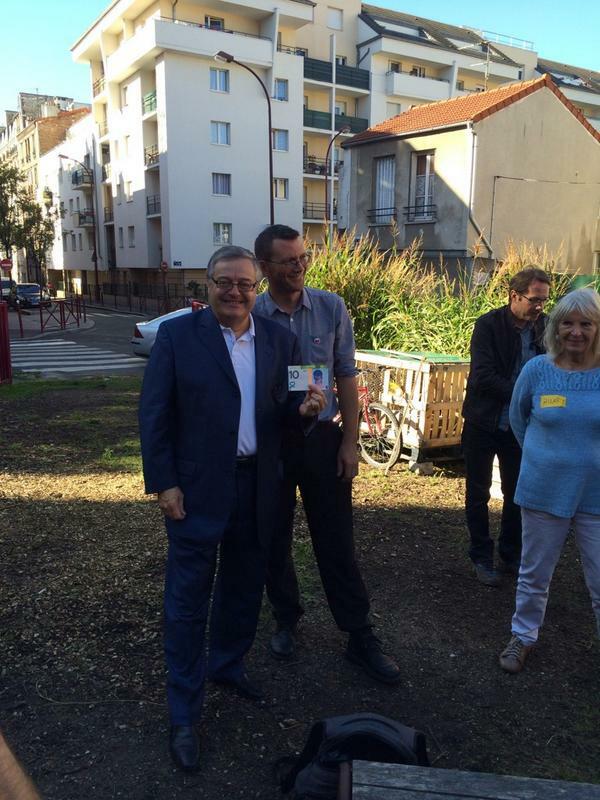 I travelled to Paris for 2 very full days to help launch the book and give the initiatives there a boost. The main event was a talk on the Friday evening. I was straight off Eurostar and over to the venue. It was a great evening. 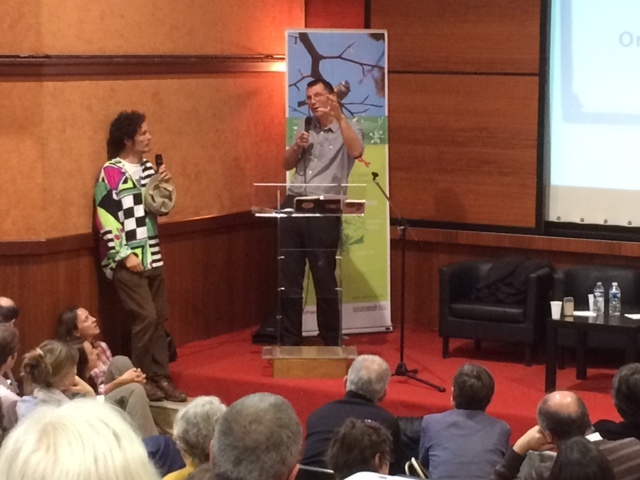 Natureparif, our hosts for the evening, do great work to promote biodiversity in France. Their events hall was packed, with many people having to stand around the edges. Surely communities having their own currencies is a form of regression rather than progress? How can people make a living doing Transition? Can Transition function in big business? The evening was wrapped up by short presentations from some of the French/Belgian Transition initiatives whose stories are told in the book, and then that was that. After lots of book signings and talking to people, the day drew to a close with a few Parisian beers in a gorgeous old basement. Next morning started with a walk around the 15th Arrondissement of Paris, home to my hosts and to an active Transition initiative. Thriving commercial streets of small independent traders cheek by jowl, the kind of local economy that valuing small independent traders can create. I stocked up on cheese, which now sits next to me, gently ponging, as I make my way home by train the following day. Our walk led us to the suburb of Pré Saint Gervais, visiting a project called Le Pouce Vert (French for ‘Green Thumb’). A former piece of unused wasteland has been converted into a community garden. Many members of Le Pré Saint Gervais en Transition had gathered there, for food and conversation. I was shown around the garden, which combines imaginative food production and a real effort to maximise biodiversity. There are wild areas, ponds, and one of the most beautiful Insect Hotels I’ve seen. I met lots of the members of the group, people involved in the garden, and also people from nearby Transition initiatives who had come along for the event. I was told the story about how the garden finds itself under threat from development. The Council want to build next to the garden, and to convert two-thirds of it into a more formal, traditional, un-biodiverse park. The garden group are gearing up to try and protect what they have created, to hopefully protect all or most of the garden. 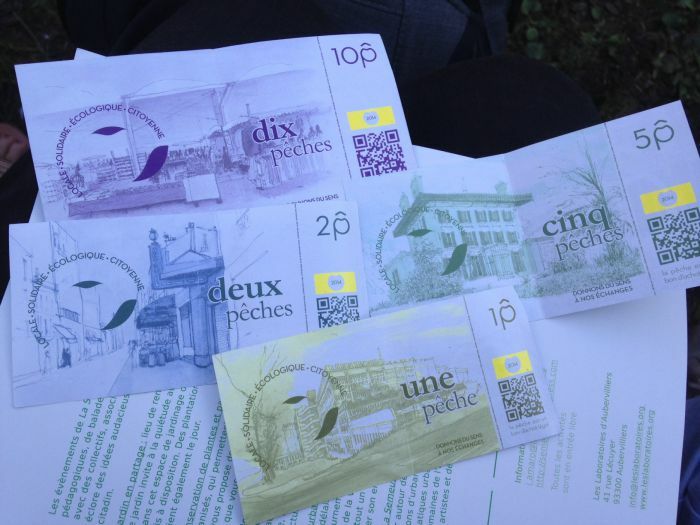 We heard from people from different initiatives, including Transition Montreuil who recently launched their local currency, La Pêche, named after the peach trees grown as espalier trees against walls for which Montreuil is renowned. We were joined by the area’s Mayor who talked about their proactive work in the fields of waste and recycling, and the extent to which he is taking climate change seriously. Finally, we were treated to a short recital of a few pieces of classical music by two local young women. After some more book signings and farewells, a group of us headed off to the Festival du Livre et de la Presse d’Ecologie (a green literary festival). On arrival I did an interview, signed some books and then did a short presentation, a briefer version of the previous night’s talk. After questions, I signed more books, before heading out into the night. Back at the apartment of my hosts, Corinne and Ted, a party was underway with people from the 15th Arrondissement Transition group and some from elsewhere. Good food, delicious wines, good conversation, a great icebreaker where people introduced other people to the group and much sharing of experiences and advice. A delightful end to a great couple of days. I was up at the crack of dawn the next day heading for the Eurostar home, out through the deserted early morning streets, nagglingly unsettled by the warmth of the day (at 6am I wore just a t-shirt, in mid-October), but inspired by how quickly Transition seems to be spreading across France, and the ambition, commitment and richness of what people are doing in response to the climate crisis. The REconomy project seems to fit beautifully into peoples’ approach. My thanks to all the wonderful people I met for their kindness and hospitality. Thanks to Christophe, Sophy and everyone at Seuil for being so wonderful to work with, all the book’s translators, Josue, to Ted and Corinne for their hospitality, to my various translators, and to the people at Natureparif.